We teach boxing in a class environment that is focused on skills development and training. Classes have been developed using traditional boxing techniques, including elements adapted from the AIS (Australian Institute of Sport) Olympic boxing program. Competitors training at Joe’s Boxing have won two state titles in recent years, and our top student made the Nationals & Commonwealth Games Trials in 2017. The Black Shirt Program is the cornerstone of our school, where the emphasis is on student development. At this stage in your boxing journey, we aim to develop core skills rather than have you engage in competition. The aim of the Black Shirt Program is to take a student from beginner through to the equivalent skill level of an amateur boxing competitor. The training consists of a refined series of drills, combinations, and ultimately sparring, a well-travelled journey that can usually be achieved within two years. The program uses a grading system of coloured shirts, which establish the foundation and provide goals for each student to reach. The ultimate student test is the Black Shirt grading. This requires the student to participate in an exhibition match, comprising of 3x 2-minute rounds of boxing, as part of our annual Joe’s Boxing Black Shirt Graduation fight night which generally attracts a crowd of over 100 people. Upon successful completion of your Black Shirt grading, your name will be added to the Joe’s Boxing Honour Roll which is displayed on the wall for all to see. All students attending Joe’s Boxing need to participate in our Black Shirt program, as it provides you the structure, motivation, and benchmarks to work towards throughout your training. 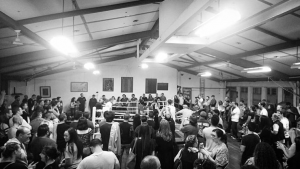 Importantly, it gives all students the opportunity to display their skills, and experience what it’s like to step into the ring and face a real live opponent in front of a large crowd. 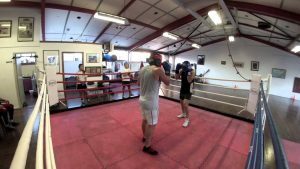 It’s the closest you will get to experience what it may be like to compete as a competitive boxer. Well worth the journey! Joes Boxing Black Shirt graduation fight night in full swing. After achieving the black shirt, you can go on to amateur competition under Boxing NSW Australia, the only Olympic certified organization within Australia. Or perhaps you’d like to join our coaching staff and teach others (and get to sit ringside at competitions). We offer a few different alternatives for private training sessions. Steph – Teaches classes here and offers private lessons currently at $50 per hour with limited availability weekdays. Steph has a wealth of knowledge in Boxing as well as fitness and flexibility. She is tiny so suitable for girls or smaller guys. You can contact Steph directly via email at schmittkin@gmail.com or fill out the enquiry form on the website. Pablo – In addition to working at the gym and teaching classes, Pablo offers private training sessions for $70 per hour for one off, or cheaper if you pay a block in advance or are on a Joe’s Boxing membership. He’s available Mondays, Fridays, and Sundays, and by appointment on some other days. You can reach Pablo for private training on 0421 417 335 or fill out the enquiry form on the website. Justann Crawford – A legend of the Australian boxing scene; two time Olympian, nine times Australian champion, and an all-around nice guy. If you’re looking for the best guy on the pads in Australia, Justann is your man. He works out of Balmain Fitness (0418 248 868) and you can book an hour of his time for around $90. Joe – Joe only does private sessions for long term members or those members actually competing with Boxing Australia NSW. The best way to get his attention for one-on-one training is to come to class consistently over a long period of time and show your commitment on the gloves and in the ring.